Intelligent Operations and Management, in general, and, Intelligent Network Operations and Management, in particular, is increasingly about End-to-End control across multiple networks/services; across multiple layers in network, computing, and software stacks; and, across a variety of time-frames. It is, therefore, a problem of integration and analysis of huge amounts of very heterogeneous data in real time. This talk will contain an overview of AT&T Shannon Labs research, and a discussion of our work in Information Mining and Software Research with applications in telecommunications industry including network operations, network security, IP network management, fraud detection, marketing, and business & consumer markets analysis. The emphasis will be on near real-time analysis and mining of large scale data streams. Selected future research direction will be presented. Dr. Mahmoud Daneshmand is a Distinguished Member of Technical Staff, AT&T Labs Research; Executive Director of University Collaborations Program and Assistant Chief Scientist of the AT&T Labs; Professor of CS Department as well as Howe School of Technology Management at the Stevens Institute of Technology. He has more than 35 years of teaching, research & publications, and management experience in academia and industry including Bell Laboratories, AT&T Labs, and University of California at Berkeley, University of Texas at Austin, Tehran University, Sharif University of Technology, National University of Iran, New York University, and Stevens Institute of Technology. He has published more than 70 journal/conference papers and book chapters. Co-authored two books, and has given several keynote talks, and served as general chair and TPC chair of many IEEE conferences. His current areas of teaching and research include Artificial Intelligence; Knowledge Discovery and Data Mining; Complex Networks Analysis, Sensor Networks and RFID Systems reliability & performance and data mining of sensor and RFID data. He has a PhD and MA in Statistics from the University of California, Berkeley, and MS and BS in Mathematics from the University of Tehran. Information-Centric Networking (ICN), also referred to as content-centric, content-aware or data-oriented networking, is seen as an emerging paradigm that tries to re-focus communications, centering on content access rather than on host-to-host interaction as is the case today. The proliferation of user-generated content and the fact that the vast majority of interactions over the Internet concern media content access has led researchers to think of new communication models in which information/content comes on center stage and is accessed in a location-independent fashion; in addition, the underlying network is aware of the content characteristics and optimizes delivery accordingly. The resulting communications paradigm is receiver-driven, with “time-phased” multicasting and in-network caching being the norm. The network infrastructure becomes more intelligent, with application logic potentially executing within the network in order to support demanding media applications that are not possible today. This presentation will start with an overview of information-centric networking, it will present the state-of-the-art in the relevant research activities and will consider the current state and key challenges. The management challenges of the expected fluid and more dynamic network infrastructure will also be specially considered. George Pavlou is Professor of Communication Networks in the Department of Electronic and Electrical Engineering, University College London, UK, where he coordinates activities in networking and network/service management. Before re-joining UCL in the beginning of 2008, he was for ten years (1998-2007) Professor of Communication and Information Systems in the Department of Electronic Engineering, University of Surrey, UK. He holds a Diploma (MEng equivalent) in Engineering from the National Technical University of Athens, Greece, and MSc and PhD degrees in Computer Science from University College London. His research interests focus on networking, network management and service engineering, including aspects such as traffic engineering, quality of service management, policy-based systems, autonomic networking, information-centric networking and communications middleware. He has been instrumental in a number of collaborative research projects that produced significant results and has contributed to standardization activities in ISO, ITU-T and the IETF. Prof. Pavlou is currently the Vice Chair of IEEE CNOM and has been the technical program co-chair of the 7th IFIP/IEEE Integrated Management Symposium (IM 2001) and the 10th IFIP/IEEE International Conference on Management of Multimedia and Mobile Networks and Services (MMNS 2008. He has published extensively and has given invited talks and tutorials in major international conferences. See http://www.ee.ucl.ac.uk/~gpavlou/ for more details on his research activities and his publications. This talk will discuss the convergence of three important mega trends, Digital Transformations, Sustainability and Mass Collaboration and how they can help accelerate business and society to a more sustainable trajectory and future. Initially the talk will discuss important future technology developments such as Exascale computing and discuss how Moore’s law is colliding with many domains to create disruptive and positive change. The talk will then focus on how computing and communication technologies can help drive sustainable change and introduce how the IT Capability Maturity Framework can help ensure that in aggregate the value potential of new technologies can be harnessed optimally. Lastly the talk will discuss the importance of mass collaboration and sustainability paradigms and cite the smart grid as an excellent example of how these three mega trends can create significant value and a more sustainable future. Martin Curley is Director of Intel Labs Europe and a senior principal engineer at Intel Corporation. Intel Labs Europe is a network organization of twenty two labs and over nine hundred researchers/developers in Europe, with a mission of helping advance both Intel research and European Competitiveness/Society. Most recently Martin was Global Director of IT Innovation at Intel Corporation. Previously Martin has held a number of senior IT Management positions for Intel and held management and research positions at General Electric and Philips. Martin has a degree in Electronic Engineering, a Masters in Business Studies from University College Dublin, Ireland, a PhD in Information Systems from the National University of Ireland, Maynooth. Martin is author or co-author of three books on technology management for value, innovation and entrepreneurship. Martin is also Professor of Technology and Business Innovation at the National University of Ireland, Maynooth and co-founder/ Director of the Innovation Value Institute, helping lead a unique industry-academic open innovation consortium to advance IT management and innovation. Martin is a fellow of the Institution of Engineers of Ireland, the British Computer Society and the Irish Computer Society and has been a visiting scholar at MIT Sloan. The IEEE Standards Association is one of the world’s leaders in establishing a wide breadth of standards, especially those related to communications standards. This keynote address will describe: IEEE-SA’s role and the scope and significance of its activities in standards setting; the position that the IEEE Communications Society is playing in the arena; and the means by which standards projects and working groups come into an existence. The speaker invites individuals or corporate entities to become involved in proposing new initiatives. Curtis A. Siller, Jr. received his university education at the University of Tennessee Knoxville (USA), including his Ph.D. in 1969. He specialized in plasma physics and electromagnetic theory. He then joined Bell Laboratories, where over a long career he worked in antenna and communication theories; signal processing; network architectures; and standards development (IEEE, IETF, ATM Forum, Video Services Forum, among others). Siller was later CTO for two companies developing Internet technologies. He is Founder/Principal of Enginnovation, a consulting practice engaged in intellectual property protection. Curtis has published nearly 70 refereed papers, is co-editor of a book on optical networks, and contributed to other reference texts. He was awarded eight patents, was named a Bell Labs Fellow (1989), and is an IEEE Life Fellow (1992). Siller is Director of Standards in the IEEE Communications Society (ComSoc). He previously served as a Director in two other roles; was twice a ComSoc Vice President (1998-2001); ComSoc President (2004-2005); IEEE Division III Director (2008-2009); plus holding numerous other positions. He currently serves on six IEEE Committees and Boards. Social metrics have recently been considered to capture the degree of similarity in interests of the nodes as well as their “standing” within a community or network. In this talk some recent works-examples are briefly presented showing the potential benefits from incorporating social metrics in content replication, forwarding and placement. More specifically, a framework for assessing interest similarity is presented and applied to illustrate how similarity affects the effectiveness of content replication and forwarding. In addition, the widely adopted Betweenness Centrality metric is revisited and issues associated with its computation and appropriateness for content forwarding are discussed. Then, modifications and easily computable variants are introduced and their effectiveness is illustrated. Prof. Ioannis Stavrakakis,IEEE Fellow. Prof. of Informatics and Telecommunications, National and Kapodistrian university of Athens (NKUA), Greece. Diploma in Electrical Engineering, Aristotelian University of Thessaloniki, (Greece), 1983; Ph.D. in EE, University of Virginia (USA), 1988; Assist. Prof. in CSEE, University of Vermont (USA), 1988-1994; Assoc. Prof. of ECE, Northeastern University, Boston (USA), 1994-1999; Assoc. 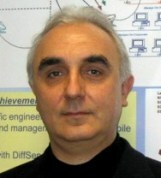 Prof. of Informatics and Telecommunications, NKUA (Greece), 1999-2002 and Prof. since 2002. Teaching and research interests are focused on resource allocation protocols and traffic management for communication networks, with recent emphasis on: peer-to-peer, mobile, ad hoc, autonomic, delay tolerant and future Internet networking. His research has been published in over 180 scientific journals and conference proceedings and was funded by NSF, DARPA, GTE, BBN and Motorola (USA) as well as Greek and European Union (IST, FET, FIRE) Funding agencies. He has served repeatedly in NSF and EU-IST research proposal review panels and involved in the TPC and organization of numerous conferences sponsored by IEEE, ACM, ITC and IFIP societies, including: organizer of the 1999 IFIP WG6.3 workshop, the COST-NSF NeXtworking’03, the Workshop on Autonomic Communications (WAC2005); co-organizer of the 1996 ITC Mini-Seminar, the IEEE Autonomic Opportunistic Communications (AOC’07&’08); technical program co-chair for the IFIP Networking'00, EWC’04, IFIP WiOpt’05, COST-NSF NeXtworking’07; general co-Chair for Networking’2002, IFIP MedHocNet’07. He has served as the chairman of IFIP WG6.3 and elected officer for the IEEE Technical Committee on Computer Communications (TCCC). He is an associate editor for the Computer Communications journals and has served in the editorial board of the IEEE/ACM transactions on Networking, ACM/Kluwer Wireless Networks and Computer Networks Journals. He has served as head of the Communications and Signal Processing Division and is currently Deputy chair of his Dept and Director of Graduate Studies.